NEW DELHI: Congress general secretary Priyanka Gandhi Vadra on Monday made her much-awaited debut on Twitter. Within minutes of joining the microblogging platform, she has gained thousands of followers. However, from her verified account, Priyanka as of now is just following seven handles. These are party leaders Sachin Pilot, Ashok Gehlot, Ahmed Patel, Randeep Singh Surjewala, Jyotiraditya Scindia and Rahul Gandhi. 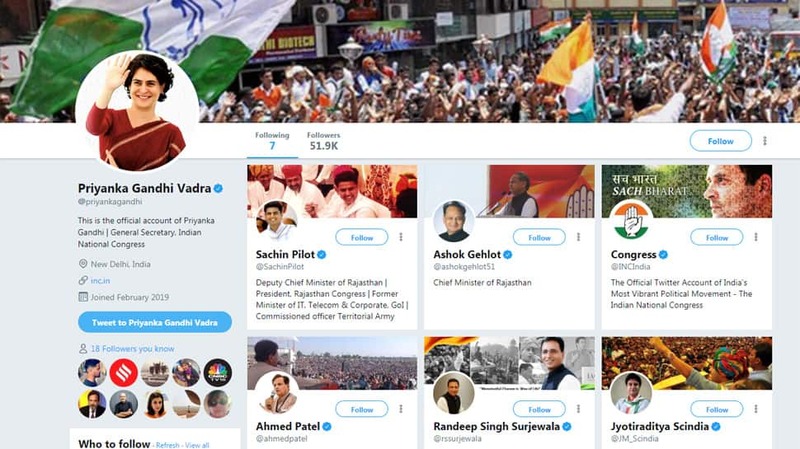 Apart from the leaders, she is following the Congress party’s Twitter account. Priyanka made her social media debut ahead of her mega roadshow in Lucknow, her first after joining officially joining the party. She logged on to Twitter with the account @priyankagandhi on the day of her maiden visit to Uttar Pradesh as an AICC general secretary. The Congress has learnt from its 2014 debacle and has scaled up its social media presence. Even in the December 2018 state elections, the party aggressively used social media to challenge the BJP. Party chief Rahul Gandhi has also been using Twitter for his attacks on the government.